As predicted by the Chinese Horoscope 2019 for Buffalo or Ox, multiple changes will take place in the life of the natives. The influence made by other people will be beneficial, who will serve as a source of inspiration to achieve their goals during the course of the year. In 2019, the year of the Pig, the Buffalo or Ox natives will have to establish new strategies and develop them without fear until they are fully executed. This Chinese zodiac sign seeks to make radical changes in your life, overcoming the possible obstacles that appear in their way thanks to a wise practical approach. The Chinese Horoscope 2019 for Buffalo or Ox indicates that the natives should make use of their intellectual capacities as a preventive measure at the time of making decisions, thus avoiding taking those that are incorrect. It is highly recommended not to get into problems relating to legal matters while you are helping friends or acquaintances in June 2019. Those who were born in the years 1901, 1913, 1925, 1937, 1949, 1961, 1973, 1985, 1997 and 2009 are part of this Horoscope. The months of May and August will be full of misunderstandings between the people who form the marriage, something that will have an easy solution if both parties are aware that they must give up a little in order to maintain the bond that unites them. According to the Chinese Horoscope 2019 for Buffalo or Ox, the relations between the spouses will be much more productive for both at the end of the year. In order for this fortunate end to arrive, it would not be superfluous to strengthen the sentimental relationship with small trips made between June and October. In the event of Buffalos finding themselves single, passionate romances will arise and will make them enjoy some unique moments that they will always remember. During this year of the Pigs, you will have to be careful to produce apparently harmless cuts. They must be disinfected immediately. It will be a good year for nature excursions, whether forests, mountains, lakes… this will generate a recovery of vitality. 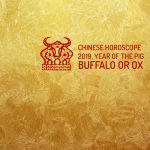 The Chinese Horoscope 2019 for Buffalo or Ox predicts that the greatest financial capabilities will be at their best in August. An ideal moment to make an analysis of expenses and to suppress all those that are considered superfluous. As far as the family is concerned, relations will be very harmonious, which will allow them to be at peace with their loved ones, something that emotionally will help them to enhance their emotional health. Therefore, the Chinese Horoscope 2019 for Buffalo or Ox indicates that it will be a period of many changes and where the natives will receive the beneficial influence of other people.